Dynon is no longer supporting software version 6.2, which is the previous version available from Flight Design. Flight Design has now released an official update to the Dynon Skyview which brings us to 11.1. 1. Follow the download link below. This will bring you to the Flight Design download page. 2. In the folder tree, navigate to your file by clicking on the folder names which are applicable to your aircraft and download the appropriate file. *Note: There are four options for avionics listed. They are the Garmin GNC 255A, GTR 225, Dynon 261 transponder, and Garmin GTX330 transponder. If you have a component which is not listed, you may download any file. However, if you have one, but not the other component, you may only download one of the two files which has your component. For example, if you have an SL30 or SL40 with a GTX327, you may download any file and it will not affect the function; but if you have an SL30 or SL40 and a Dynon 261, you must download either of the files with a Dynon 261. 3. You must unzip the file in order to load it onto the Dynon. Detailed instructions are on the download page. Flight Design has released a Service Bulletin affecting all of its CT-series aircraft. The bulletin requires inspection of the BRS hatch installation and can be found on the Flight Design Service Bulletin page. Flight Design has just released a Service Bulletin for the inspection the BRS handle bracket for the absence of cracks in the bend radius at the base plate. is applicable to all CTSW, CTSW-LSA and CT Supralight with Airframe Emergency Parachute System BRS 1050 and 1350 installed, from S/N 05-01-01 / D-05-01-01 and E-09-02-11 without country limitation. South Woodstock, CONN. / October 21, 2014 — Flight Design USA has maintained the largest fleet Light-Sport Aircraft for the entire ten year history by always striving for the finest customer service in the sector. A clear reason for their success is a network of qualified dealers and distributors with a similar commitment. One of those is Flight Design West, an exhibitor at the 2014 Flying Aviation Expo. Flight Design West is led by president Kenny Scherado, the founder of Lone Mountain Aviation, a western company based at the Northwest property of the North Las Vegas Airport in Las Vegas, Nevada. In addition to Lone Mountain, Flight Design West also lists dealers as Sonoma Jet Center in Northern California and Copper City Aviation in Bisbee, Arizona. Supporting Flight Design West, Scherado’s Lone Mountain operation is an authorized service center for Cirrus, Cessna, Piper, and Mooney. They provide an avionics repair station and offer workshops for composite repair, sheet metal, plus general maintenance. The company is one of the few Certified Repair Stations in the country with a Class 1 Unlimited Composite Repair Rating. As Flight Design’s CTLSi and earlier models are built of 98% carbon fiber constructions Flight Design West makes good use of Lone Mountain’s expertise with such materials. 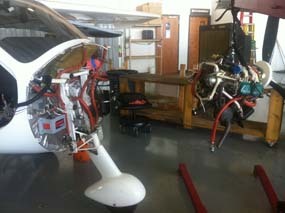 All operations are conducted under approval as FAA 145 Repair Station L9OR473Y. 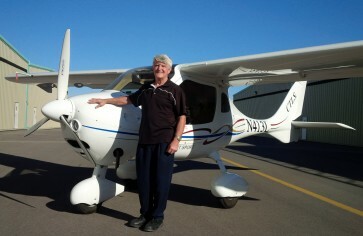 An Air Force veteran, Scherado has more than 45 years of experience in general aviation and major airlines. Kenny is an A&P with Inspection Authorization, a Designated Airworthiness Representative for FAA, and an instrument rated private pilot. 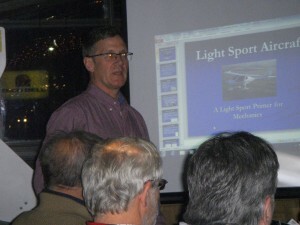 Scherado created Lone Mountain Aviation in 1982. At the Flying Aviation Expo, Flight Design West is displaying their CTLSi for visitors to examine. The model is part of the CT series from Flight Design in Germany that has continuously remained the top-ranked Light-Sport Aircraft for more than ten years. CTLSi is a wide cabin Light-Sport Aircraft superbly equipped with an all-digital instrument panel, the fuel injected Rotax 912 iS engine, and a BRS airframe parachute system. Flight Design is a 25-year-old manufacturer based in Germany. 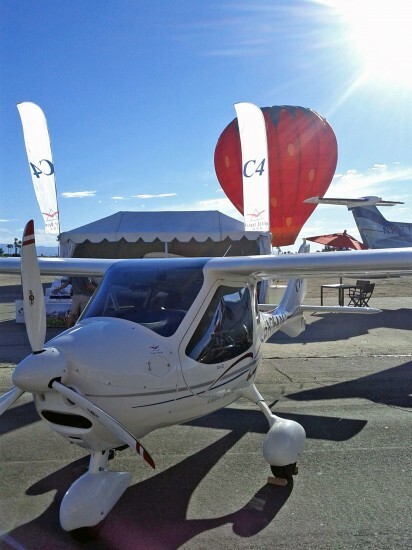 The company remains the worldwide Light-Sport Aircraft market leader thanks to its popular CT series of aircraft. More than 1,800 of these aircraft are flying in 39 countries. One of the first aircraft certified under ASTM International standards in 2005, the CT (“composite technology”) remains the top-selling LSA in America through eight consecutive years. Flight Design sold the first LSA to India and was the first LSA to earn Chinese Type Design Approval. Three times a CT has been flown around the world. In 2011, the German company unveiled its C4 four seat aircraft based on the CT technology. Flight Design has issued a Mandatory Safety Alert (SA) issued December 19, 2013. For Fuel Injected CTLSi aircraft. This Safety Alert requires you to determine, by reference to engine type – Rotax 912iS, if your aircraft has been affected. Detailed information is available on the Flight Design webpage: http://www.flightdesign.com/index.php?page=service, as contained in SA-ASTM-CTLS-04/ SA-LTUL-CTLS-04 documents. 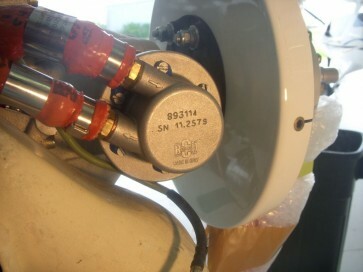 This Flight Design SA requires verification of ground wiring Lane A connection to regulator of Lane A prior to next flight. This verification may be done by the Owner / Operator. If your aircraft is not affected, this must be noted in the logbook that the SA is complied with by non-affectivity due to presence of non-conformance. For affected aircrafts, full compliance with SA-ASTM-CTLS-04/ SA-LTUL-CTLS-04 must be carried out and so noted in the logbook. If you have a CTLSi and did not get an alert Email Please go to our Contact us to be sure we have the correct email address. the following link is to the Flight Design Bulletin. (Reminder: Continued airworthiness regulations require the owner / operator to check for applicable Notifications frequently, considering airframe and all installed equipment manufacturer information!). As per our production documentation, none of the engines installed ex factory is affected by the Rotax ASB. With this, our Safety Alerts require mandatory inspection of the aircraft only, when the engine has been exchanged after delivery of the aircraft from the factory, as only this way an affected engine could have been installed to the aircraft. The attached SA´s are divided in different files according to the certification basis affected. Please select the documents applicable for your certification basis. We spent best care in generating these documents to ensure that the information presented is adequate and correct. However, mistakes can never be excluded 100% and individual situations might require adjusted measures. Therefore, in case of any doubt, missing information or if a possible misunderstanding is expected, please do not hesitate to contact us. Our technical team will provide you with fast and direct support. SB-ASTM-CTSW-10 Inspection of the Rescue System Rear Harness Connection. Please note that this SB applies to CTsw from serial numbers 06-01-07 to 06-11-13 and the SB gives the owner the directions/instructions to make sure it has been complied with. Flight Design issued a Mandatory Safety Alert (SA) on May 30,2012, based on information from the Rotax engine Alert Service Bulletin ASB-912-061UL. 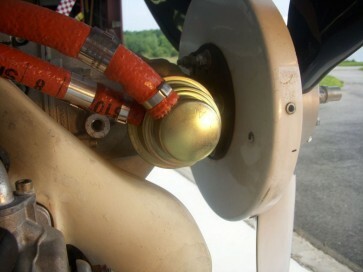 The SA applies to the output ( pressure) side hose of the new style fuel pump. The problem surfaced on more recent, not all, fuel pump installs. No Flight Design aircraft shipped to the USA originally had the affected parts according to our records, but normal maintenance practices such as fuel pump replacement or engine overhaul may have changed to the new style fuel pump from the factory supplied parts. We cannot be sure of the history of every aircraft. Therefore ALL aircraft must be inspected. Even if you know the history of the specific plane this SA requires action by you prior to the next flight. You will see that all CTLS, CTsw, MC, CT2K are affected by the bulletin and as part of the responsibilities of the owner/operator of an ASTM compliant LSA the alert requires an inspection and engine logbook endorsement prior to the next flight. The inspection may be done by the Owner and that inspection noted in the engine log book. However, this is a serious issue and it must be addressed as required in the Safety Alert (SA). It is not likely that you have one of the pumps. The two pictures show the ‘old’ and the ‘new’. If you have the old ‘gold dome’ pump the output pressure hose Service Alert does not apply and you only need to document the inspection and compliance with this Safety Alert in the engine logbook. No task specific training or mechanic rating is specifically required. If you have the newer ‘made in Italy’ pump, you must check the serial number in the Rotax ASB and confirm that your pump is not affected. If it is you must comply in the manner specified in the SA and the Rotax ASB. Tom Peghiny speaks to a full room at the Hartford / Springfield Professional Aviation Mechanics Association (PAMA) on regulations regarding LSA and certified mechanics. FAA representative Pete Lindberg said “you really know the regulations” and commented on how well Flight Design USA is getting the information out to owners. Also in attendance were several Directors of Maintenance for major operators in the area and the Director of CT Aero Tech, the states premier school for aviation mechanic training. Interest was high by the membership and several misconceptions were resolved during the Q & A that punctuated the presentation. SOUTH WOODSTOCK, CONN. / January 6, 2012 – Flight Design has appointed US Aviation of Denton, Texas to provide Factory Authorized service for the popular CT series of Light Sport aircraft. The Texas company has been a Rotax Service Center for several years and has more than 20 A&P mechanics on staff. Combined with its FAA 145 Repair Station, US Aviation is a major flight school with extensive contracts to train foreign flight students.